Qadun is in his favorite state of mind: fully awake but relaxed, unperturbed by thought or emotion, extending his senses outward, into the landscape around him, becoming one with it. Sky. Rocks. Sea, glittering and ever changing, murmuring and whispering to him... He closes his eyes and lets the sound of breaking surf gently rock his consciousness. As wave after wave sweeps in from the bay, time collapses to an eight-second loop on endless repeat. Wave. After wave. After wave. Startled, he breaks out of his meditation pose and turns around. She is traditionally attired in an embroidered Han-style dress reaching all the way down to her heels, tied around her slim waist with a silk girdle. Her delicate Asian features are framed by a cascade of jet black hair and crowned by a bun at the back of her head. She shakes her head, a hint of puzzlement in her smile as she looks him over. The voice is a man’s, but the creature standing in front of her is definitely not human. Bipedal, little more than half a meter tall, with a flat, ridged head, short but muscular limbs, powerful claws, undersized bat wings and a segmented body extending into a long, curled tail. Thick, yellow plates on the front; scales everywhere else, shifting from black on the sides to cobalt blue on back and tail, spiky and glittering like metal. Unmistakably reptilian, with yellow eyes and slit pupils, he looks like an oversized, armored newt with avian aspirations. “A stellarium, I think. It’s over there, on the promontory.” He looks over his left shoulder and points toward the sea. Qadun looks straight at her again. “Were you expecting something harder to find? A puzzle, maybe?” Had he been equipped with eyebrows, one of them would be raised now. “Basilisk hatchling. We are renowned for our technical prowess.” He hints again at a bow, little more than a slow nod this time. “Of course”, says Chi, managing to make it sound like the most obvious thing in the world. “Sounds familiar, but...” He tilts his head, as if to peer behind her. He turns around and bounces toward the sea on stiff legs, long spiky tail swinging behind him. She suppresses a giggle and follows, making sure to stay well clear of the spikes. 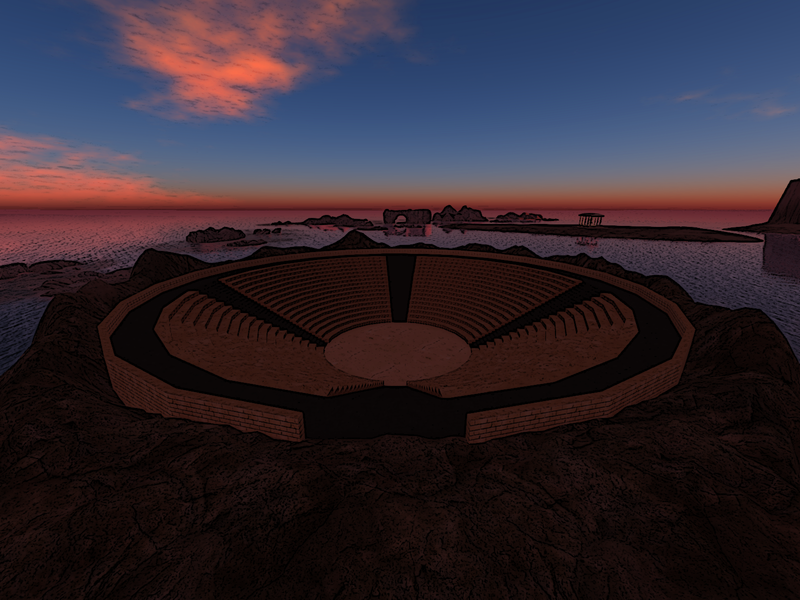 The amphitheater is surrounded by the sea on three sides. It has been carved out from the rock at the end of a round promontory. The entrance opens into the top seating tier, in front of a stairway descending to the stage. Three more stairways at right angles from each other delimit four seating sections in a classic sunwheel layout. As they walk down the stairs, Li Chi notes the many signs of time’s passage. Seats and steps are worn down or broken. Only one thing does not seem to have been exposed to millennia of wear and tear: a black sphere, about ten meters in diameter, standing at the center of the stage. As they approach, it remains perfectly smooth to the eye. There are no struts or other visible support elements. 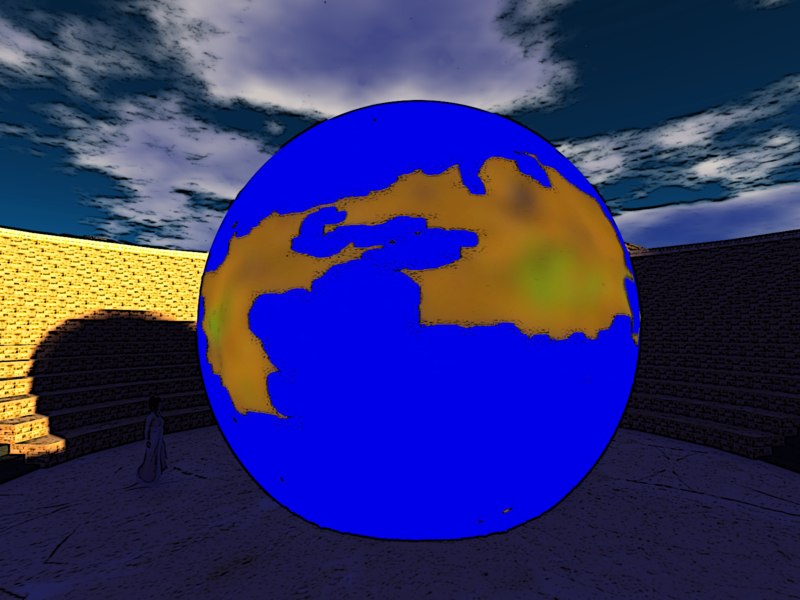 Instead, the bottom half meter of the sphere seems to have been cut off or sunk into the ground. “None needed. It’s a phantom sphere”, says Qadun and steps right through it. He watches her tap her left forearm a few times, the telltale sign that she is using a standard arm-mounted touch display, invisible to all but her, and glances down at his own. Her invitation is already there, flashing slowly. He taps ‘Accept’, and the back of the screen sinks into his scaly arm, turning into a rectangular box filled with a miniature replica of what she sees. Rather than keep staring down at it, he grips the edges of the box, detaches it from his arm, and moves it to the upper left quadrant of his field of view. The camera image stops moving. 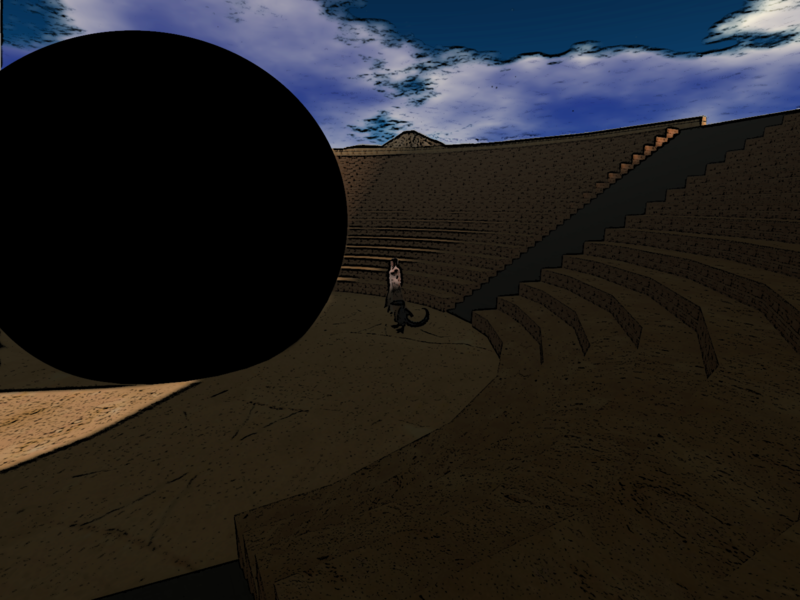 She is standing at the amphiteater’s entrance again, looking down at the sphere from the highest ring of seats. “Want to see the stars?”, he asks. He detaches the camfeed, drags it back down to his arm-mounted display, trashes it, and looks up again just in time to see her slender figure emerge from the starfield in front of him. She steps closer, then starts turning slowly to take in the view. Looking up, with her arms slightly raised as if to touch the stars surrounding her, she almost seems to dance in slow motion. “So pretty”, she says, smiling. “Um... no. This is not Earth’s sky”. She is pensive now. “If it’s Earth within a few hundred thousand years, probably. But that wouldn’t fit the continents outside. And if it is another planet... hopeless.” She shakes her head. Qadun follows her gaze. The floor is flat but transparent, and the sphere extends below it to provide a fully omnidirectional view of space. Where there had previously only been stars, a planet with blue oceans and continents in familiar shades of brown and green is now rapidly growing larger. With sudden urgency, he exits the sphere. Moments later, they are both back outside, in the amphitheater. He sits down on the floor, facing the sphere. She sits down beside him, legs neatly folded under her gown. “All of this was born out of somebody’s imagination”, she says. “OK then...”. He walks up to the sphere and waits. “Come on, sidekick!”, she says, and rushes right past him. Qadun rolls his slitted eyes, sighs, and follows her into the sphere. 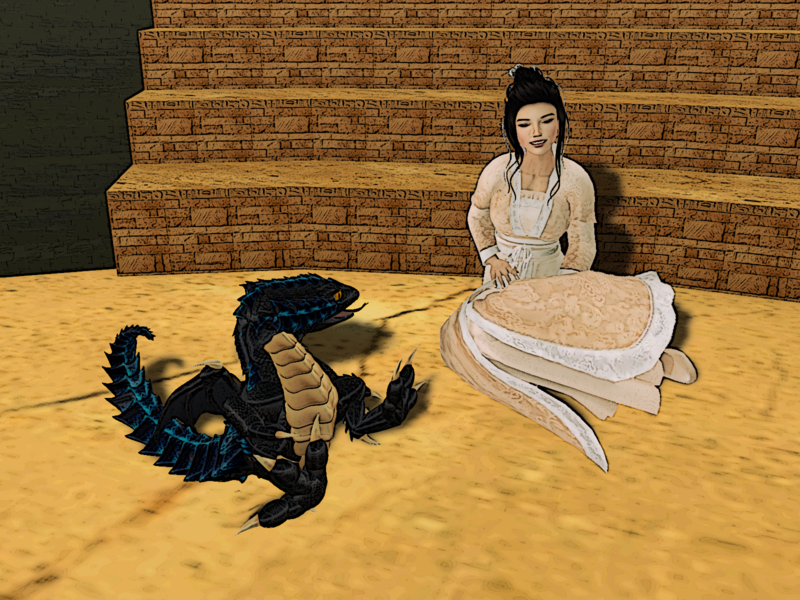 Qadun’s appearance is based on the Basilisk Hatchling avatar created by Second Life user Daryth Kennedy (pseudonym). 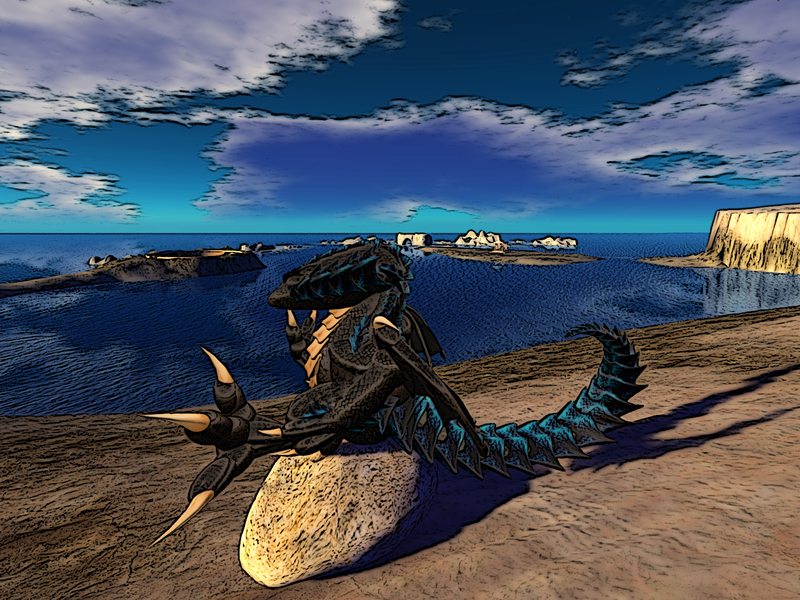 The basilisk is commonly known as a legendary reptile “reputed to be king of serpents and said to have the power to cause death with a single glance”, but in cyberpunk literature it can also be an image capable of inducing lethal reactions in those who look at it, a device first introduced by David Langford in BLIT and later used by Neal Stephenson in Snow Crash (which in turn inspired the creation of Second Life). Li Chi’s appearance was chosen to (as far as possible) fit the look of a young, unmarried, somewhat tomboyish, Chinese princess from the Han era. She wears a Han dress made by Second Life user comilla1023 (pseudonym) and “Abelli” hair by Second Life user Kateforster Akina (pseudonym). 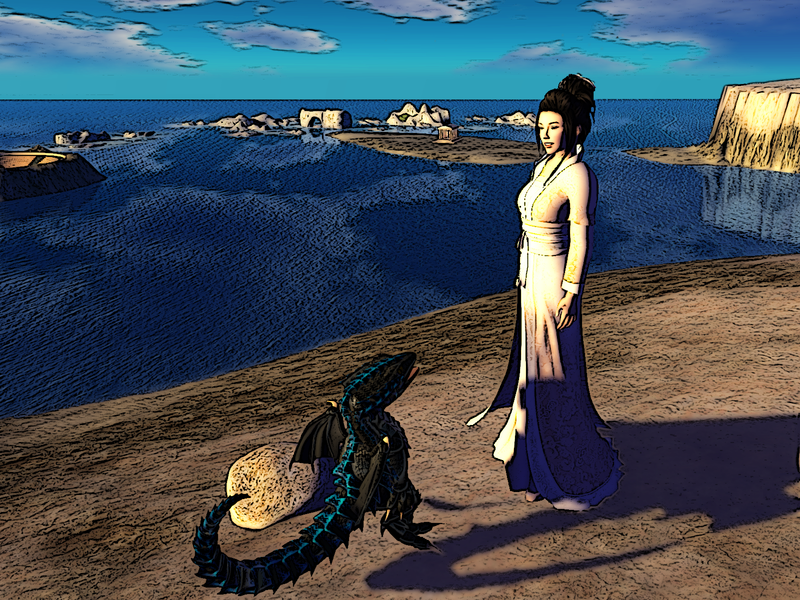 Li Chi’s name is borrowed from the serpent slayer of the ancient Chinese legend mentioned in the story. 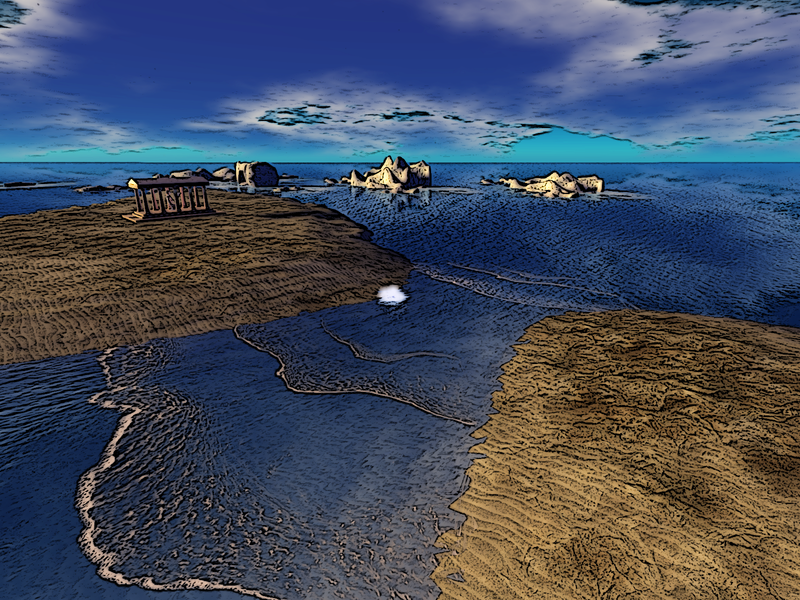 Landscape, buildings and 3D scenes were created and photographed in OpenSim using the Firestorm viewer. 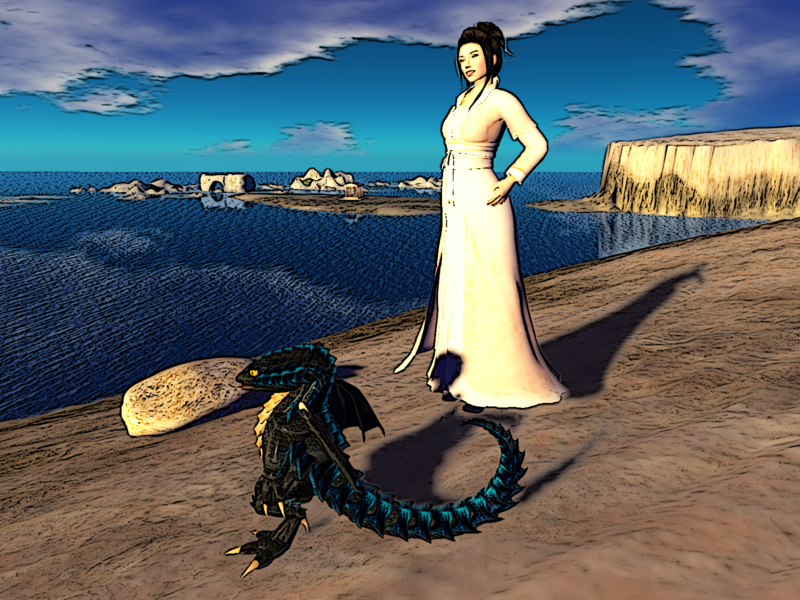 Firestorm was also used to photograph avatars against neutral (uniformly white) backgrounds in Second Life (legal note: Linden Lab’s Snapshot and machinima policy grants a license to use snapshots “within or outside of Second Life in any current or future media”; the photographer owns the copyright). 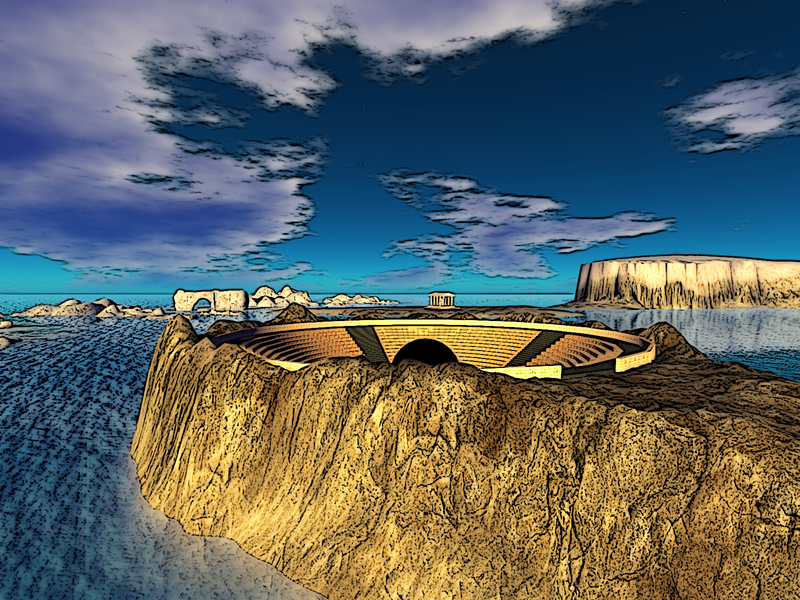 The images were edited, composited and processed using GIMP to create the final, cartoon style illustrations. 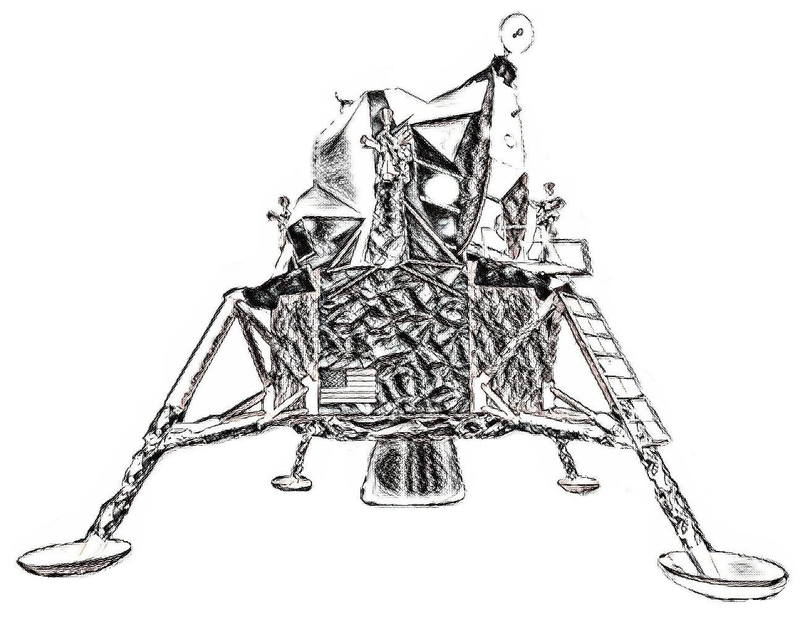 The sketch of an Apollo Lunar Excursion Module was created by passing a snapshot of a 3D model through Artify and manually cleaning up the result in GIMP. 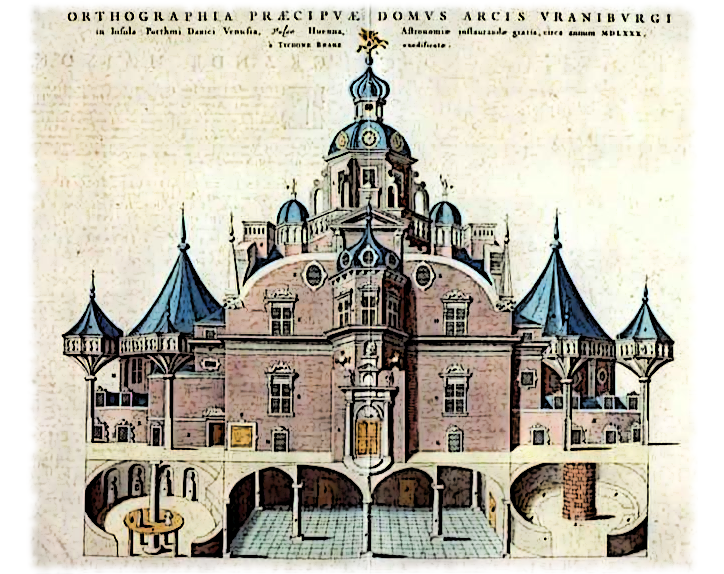 The drawing of Uraniborg is a minimally processed public domain photo of a copper etching from the 1663 Blaeu’s Atlas Major. These less realistic styles were chosen to fit the nature of the illustrations: memories recounted by the characters rather than parts of the scene. The web page where it all comes together uses Pure.css. The whole process began by dreaming up the (intentionally open-ended) plot and writing the story (in English, past tense) during the Christmas holiday of December 2016. 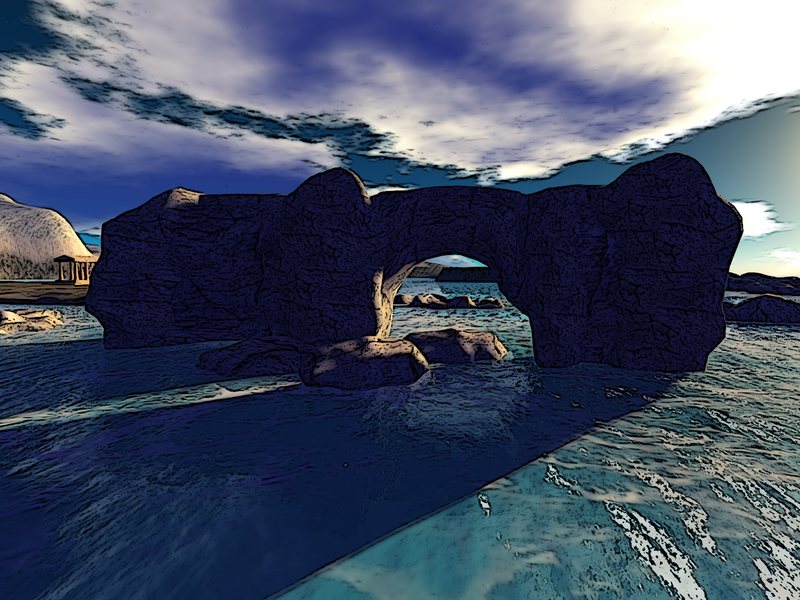 I then translated the text to Swedish (still in past tense), assembled the assets for the avatar images, did initial photography in Second Life, built the 3D scenes in OpenSim, and went through several rounds of photography and compositing. Final selection of the illustrations and integration with the text began a few days into the new year, at which point I realized that present tense works much better for an illustrated story. If you find spots where the text suddenly switches to past tense, it means that I missed them during the ensuing revision. Finally, after it was all done, it occurred to me that a mysterious black object perfectly embodying an elementary geometric shape, “full of stars” and capable of transporting travelers to other worlds, has previously graced the annals of Science Fiction. But at least it wasn’t spherical, and I don’t think it ever displayed maps.